Age of Empires III Heaven » Forums » General Discussions » Maffia or SCP can you please add this? Topic Subject: Maffia or SCP can you please add this? Go to the homepage, then look on the left for "Game Info". Many entries are missing pictures, and THREE WHOLE MAPS ARE MISSING! Seeing as the game is eight years old, I think it is terrible that we still don't even have the basic game info complete. I will put the needed content here so it is easy for you to add in. Game Info -> AoE3 Game Info -> Random Maps (link). You are missing the map Hispaniola (probably because it was added in one of that later patches, you managed to add Unknown even though it too was added in a patch, so there is no reason why Hispaniola should be left out). Official ES Description: Surrounded by sea, this huge island promises conflict on both land and water. Inland, Carib tribes live in the jungles around the base of an impassable mountain. Extra starting crates of Food will help jump start your early economy. Whales in the western bay are a strategic source of Coin. My Description (the page seems to use a mix of ES descriptions and custom descriptions, so you can use a mix of this and the above description): An island surrounded by many fish, with whales also present in the west, Hispaniola is a resource rich map. Turkeys and berry bushes are plentiful, and you begin the game right next to a Gold Mine and with extra food. The impassable mountain in the middle is relatively small, but does direct the fighting to the north-western and south-eastern portions of the map where naval interference in land battles is inevidable. The Carib settlements are generally evenly distributed on both sides of the map towards the edges of the map. Combined with the abundance of treasures, this map promises to keep all players in good supply of natural resources well in to late game. Tribes: Carib. No trade route. Again, you are missing Hispaniola, plus another two called Ozarks and Plymouth. Plus there are some maps there that were actually introduced in TAD, not TWC. Official Description and My Description: Same as above. Herdables, Herds and Tribes: Same as above. Minimap screenshots: Same as above. Official ES Description: Hilltop trading posts sit beside a trade route that crosses the map from East to West. Teams are split across the trade route. My Description: The first thing that comes to mind while playing Ozarks is symmetry. The land is divided in half horizontally by a trade route, and there are equal numbers of Natives on either side. Cliffs around the trade route sites create three choke points to concentrate fighting. Resources are sparse, but evenly distributed. 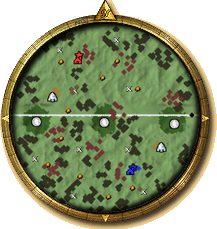 There will usually be an equal number of mines (but not herds) on each side of the map. 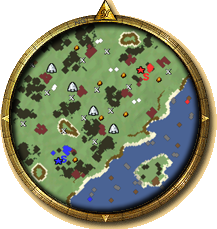 Wood may become an issue on this map late game, as the trees are spread thin in small clusters. Overall however this map offers the potential for interesting, balanced, combat. Official ES Description: Each colony can use intrepid Pilgrims and Scout Turkeys to explore the bountiful wilderness for Native Settlements and unique treasures. My Description: The beginning of a game in Plymouth is different to most other maps. You will get some extra crates, themed to look like pumpkins and other novelty items, and named "Pile of Squash". This eye-candy theme carries across to the whole map, with even the treasures (often unguarded) looking like bushels of wheat and pumpkin patches. There is even a table laid for a feast right next to your town centre! An island to the south-east in the bay contains some extra bonus crates for whoever can find them, a "Huge Delicious Feast" and some Piles of Squash (both giving food) on a farm-like eye-candy base. There are four Huron settlements in a straight line across the middle of the map, going from north-west to south-east. Coin is scarce, however you will begin with some bonus units as well: six Pilgrims (settler/villager-like units, capable of gathering resources and building buildings; do not count towards your settler build limit), an extra Native Scout, plus an Intrepid Turkey Scout (a controllable turkey with 4 movespeed and a reasonable line of sight; it cannot attack; the unit image suggests it is wearing a pilgrim hat, but the 3D model is not). Overall this map exudes a Thanksgiving theme (Thanksgiving is a holiday often celebrated in North America) and benefits rushing civs the most. Option One: Scrap the TAD and TWC specific maps pages and just have one maps page with EVERY map in the game. We can note next to each map which expansion pack it was released in. Option Two: Remove the TAD maps from the TWC maps page and merge the two TAD pages and update them with all the content missing. List of Maps that don't belong on the TWC page: Borneo, Ceylon, Deccan, Himalayas and Himalayas- Upper. Honshu also appears in the list at the top, but does not have an entry. Both Vanilla and TWC have all their units and buildings listed in the game info. TAD does not. There are many images missing from the game info (mainly under units and buildings). I will post the link to the page with the missing images, then the image. I have only done some of the images, I will do the rest at another time when Maffia/SCP gives me instructions for the specific image size/format etc. There are way too many on this page to add all the images in one go, I will probably edit in the rest later. For now, here are the first few. Keep in mind that the page refers to the old Native Trade Post units (plus some special ones from the campaigns), not the newer Native TWC units. The images may need resizing, also I might need to re-make them so they are deselected. This page is missing: House (Aztec), Shrine, Wall- Medium. This one is missing: Black Rider, Buccaneer Captain, Elmeti, Li'l Bombard, Ninja, Outlaw Musketeer, Privateer, Swiss Pikemen. Please let me know what you want to do about this, and how I can help. I'll have to play around and see how FTP access works now, but yes I'll have a look and see what I can do. Maffia, I'm working on photoshopping the map images so they actually match the ones there -- they seem to have a border that's not the one that shows up in game, so I pulled that and am merging the actual map images in. Unknown seems to have the wrong border, as well (since it was added in a later patch, as anterior mentioned). Thank you so much Maffia, finally we might complete that part of the website after 8 years lol! Maffia, I'm working on photoshopping the map images so they actually match the ones there -- they seem to have a border that's not the one that shows up in game, so I pulled that and am merging the actual map images in. Yeah, if only I had a copy of photoshop lol! If you need any other materials (images, text, info), just post here and I'll try my best. And anterior, GIMP is a good free alternative to photoshop, you might look into that. Wow, those look great! I'm assuming the first is Plymouth, the second is Ozarks and the third is Hispaniola? Can GIMP do the transparency thing where the bits that are white on my attempt actually blend in with the background of the site? Yes, GIMP can do transparency. How close are we to finishing this? I planned to have a look at this and try and sort it at the weekend, but a couple of long days at the end of last week killed most of the weekend with me being asleep, will try and find some time later this week or at the weekend. Bumping this to prevent it from being archived. Sorry, is on my to-do list, but RL stuff comes first most of the time. AFAIK I do now have access to what I need to do this. Ok, I am really really stuck (seems completely different to how FTP used to work), can someone please provide me with some step by step instructions? While we're mentioning site improvements, would it be possible to fix that the recent posts have been squished by the blog in the home page? ot sure what I can do about that, it's normally an issue when people are running with certain resolutions and would probably need quite a bit of redesigning to fix for everyone. It worked for me, now my "recent" news feed is narrower and the recent posts are wider. Thanks Maffia! 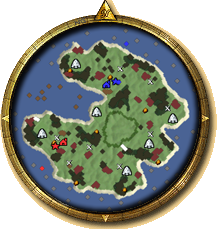 When are we getting an update just like AoE1 Heaven got? Part of it included the ability for moderators over there to instantly change parts of the site without having to access the servers. Already have a CMS here, AoE3H uses Zope which isn't great (images have to be uploaded 1 at a time at the moment) but it is usable. Haven't had a chance to look since I hit the last stumbling block, but think I know what needs doing, may just need to prod the tech guys a little more to get everything squared. Also they tech guys tell me the missing settler image is something to do with eagles and are looking into it. Anterior, do you mind if I edit the OP to cross out the fixed things? Sure, you can cross things out! Just as long as I have permission to edit the post later on if I need to. I know you moderators seem to have a thing about re-editing posts edited by a moderator. Another thing: The Big Huge Games logo on the main page leads to a dead link (BHG disspared remember?). Also the Microsoft Games logo leads to a link that always times out. Of course, that rule is mainly to prevent people reinstating inappropriate content after it has been removed. Hmm, those links are going to be somewhere else think I'll redirect BHG to the Wikipedia article if I can find where the link is. That settler image you chose looks funny. Updated cheats, left hand navbar, and community links. 1. Your new sidebar has "Campaign Walkthrough" clipping into the brown verticle line graphic. 2. The Microsoft Game Studios logo link you changed now leads to a catalogue of games unrelated to Age of Empires (it states it is for 2008-2013 only). Perhaps link to http://www.ageofempires.com/ instead. 3. Big Huge Games (and their website too) have since been resurected after my previous post in this thread which was early 2014. Also their new logo is different, and their website now makes no mention of Age of Empires. So perhaps your link to its Wikipedia page is more appropriate after all. 4. The community links page is still not up to date. It says "studio now defunct" next to Big Huge Games even though the company has since been resurected. Also the link for Ensemble Studios on that page leads to its Wikipedia page while on the main page the logo link leads to http://www.ensemblestudios.com/. For the sake of consistency both links should lead to the same place. Also there should probably be a link to ageofempires.com added there seeing as it is the official site now. 5. The staff bios page is badly in need of an update. Mister SCP isn't even mentioned there. 1. Not changed anything that should affect that, was it not like that before? Other points - will look at one day next week.